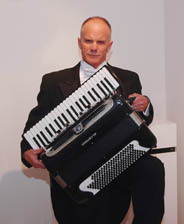 We have CD's, DVD's, Instruction Books & Original Compositions / Arrangements for the accordion! Use our Info Form to request additional information or contact us. by Dale E. Wise, M.M.E. This tune started out as a test piece to play while repairing an accordion, and ended up being a favorite to those who know it. Chromatic grace notes couple with staccato quarter notes to build four-fingered chords. The middle smoothes out much like a Grand March, then returns to the top and out. Whether you're checking for compression, or playin' up a storm, this one's a keeper! Which came first, the polka or the pen? In this case triplets and eighth note arpeggios fit the right hand so nicely, it was like "doin' what comes naturally." A favorite to those who have heard it. Fun to Play and Sing! Boogie bass, light-hearted lyrics, and a blues progression reminicent of the 50's. A great "feature tune" to play for friends, or out on the job. Delightful waltz "alla Strauss," sentimental lyrics, and syncopated melody with complementing bass patterns...it's just plain fun to play. What a happy sound! arr. Dale E. Wise, M.M.E. Have fun playing these 50 familiar novelty licks arranged for the accordion. They're entertaining "ice-breakers" that help you to establish rapport with your listeners and personalize your music. Written melodies can be played on all keyboards and treble clef woodwind, brass, and string instruments. A truly beautiful, majestic arrangement with lots of scalic and chromatic bass patterns and driving triplets in the finale complement extended harmonies throughout. The music comes to a rousing close with a deceptive cadence followed by a triumphant chordal glissando. Enjoy! Roll out the barrel..........for fun, singing, and dancing. This signature tune for the accordionist has delighted audiences for many years, and continues to be a hit at every party. Interesting bass patterns and melodic ornaments offer unique and tasteful additions to this arrangement. No repertoire is complete without it. arr. Dale E. Wise, M.M.E. & Rick Ward, M.S. "Greet the folks at home," says the shipbound sailor to the swallows. This beautiful Scandinavian waltz means so much to so many who have come to a new land. The bellows and basses of the accordion really get exercised conveying the nostalgia of it all. Compiled and arranged by Dale E. Wise, M.M.E. Written for all Treble Clef instruments and Voice, this booklet includes 30 tunes and their lyrics associated with major holidays throughout the calendar year in the U.S.A. A nice gift for any patriot, and a lot of enjoyment. Note: Also includes tunes little children enjoy..........endlessly! Raise a glass, or let someone else raise a glass while you play this Bavarian delight. Typical alternating bass patterns plus tuba-like bass runs and some Alpine "yodeling" in the right hand. Prost! Plain old fun with words and music + verses such as "Peanut sittin' on a railroad track, ......" or "Black and white animal out in the woods, ....." Good for solo and community singing, not to mention tappin' your toe. Sing, dance, and sway to this care-free Bavarian waltz. Parallel 3rds. and 6ths. in the treble, and light syncopation in the bass complement a very pretty melody. Solo or ensemble, this old gem has a new face, and is once a again a show-stopper. Try it, ......it's fun! This nostalgic, magical love song presented in a rubato fashion unfolds so beautifully on the accordion. One can almost imagine Edith Piaf singing to the troops. A surprise deceptive cadence allows the melody to soar before coming to a close. The familiar German tune, Bergvagabunden, is fun to sing, dance, and play at the start of any party with new words in English, and a nice syncopation of "quarter-half-quarter" notes. So, let's have a Party! Delightful, delirious, delicious! This is a must to add to your repertoire, and it will bring 'em to the dance floor. arr. Dale E. Wise, M.M.E..
"All join hands, and circle left!" These American Standards remain a joy to sing, dance, and play. Throw in a fiddle entrance, a little bass work, and you've got some fun. Elegant, delicate, nostalgic, this "Old World" piece with scalic bass patterns sprinkled thoughout is a delight to play on the accordion. Children, ages 2-8, can sing and dance to 15 favorite songs including The Chicken Dance, Jingle Bells, and Itsy-Bitsy Spider. Music is so important to our little ones. Share with them the gift that keeps giving. Yes, the tune is fun, but it's also very serious. As two cancer survivors, Jim Rice and I teamed up to remind all men of the importance in being screened for this dreaded disease. Caught in time, there's a very good chance for a positive outcome. "Get that test early, hear!" The gift of a lifetime. The story unfolds as "Squeeze," an imaginary character presented in various artful poses, welcomes everyone to his wonderful world of accordion, and invites children, ages 2-8, to sing and dance 15 of their most favorite songs including The Chicken Dance, Jingle Bells, and Itsy-Bitsy Spider. Also, an Introduction To Accordion compares sizes, weights, and sounds of different accordions. "Squeeze" is truly a gift that keeps on giving. Also available in Braille. Please inquire.